No mobile operating system can be called perfect, because each one has its own unique features and functionalities. You can find many mobile OS in the tech industry, but two major rivals Google’s Android and Apple’s iOS are giving each other a tough competition. In this rivalry, It has become quite hard to choose between them. 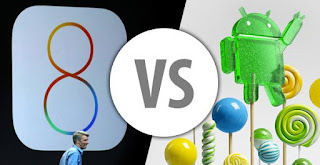 Google and Apple, both are continuously striving to be the winner of this never ending game of Android and iOS and recently they have released the latest updates Lollipop and iOS 8 with a bucket of new features and design improvements. If you are thinking to buy a new smart-phone or want to know more about these major smart-phone platforms, then you have landed on the right place. This infographic illustrates the incredible journey of Android and iOS from their initial release to the latest update along with their key features, release date and version names. This section will let you know about the whole journey of Android and iOS, key features, first release and many more. The infographic is designed and developed by Nine Hertz. From this infographic, you can analyze your requirements and features that you want to see in your new smart-phone.